Your ten-day Western Australia campervan adventure begins and ends in Perth, known for its Mediterranean climate and abundance of arts and culture. The first half of your trip takes you to the shores of Geographic Bay in Busselton, the Margaret River wine region with its vineyards and cheese and chocolate factories, on to the forests of Pemberton and the historic town of Albany. At the core of your trip is a two-day stay in Ravensthorpe, adjacent to the magnificent Fitzgerald River National Park. You will need two days to explore the Park, designated a UNESCO Biosphere Reserve and home to flora, fauna, and animals not found anywhere else in the world. From there you're off to Esperence, known for the popular Twilight Beach, and then to the gold-mining town of Kalgoorlie. The final leg of your trip is all about wildflowers, as you explore Merredin in the heart of the Wheatbelt. From Merredin you will make your way back to Perth, where you could easily extend your trip to take in any number of cultural events. Before you leave on your trip, visit Western Tourist Radio www.touristradio.com.au or up-to-date information about traveling through Western Australia. The site has useful info, but also will tell you how to learn more as you are driving through the area. The Wonnerup House, 10 km north of Busselton, was fist settled in 1834. The first house is now a dairy; and the 1859 home is a magnificent site. All the buildings, including kitchen, stables, smithy, school and teacher's house have been restored and furnished with original items. Drive 48 km west (about 45 minutes) via the Bussell Highway to the Margaret River wine region. Margaret River offers some of the best surfing anywhere, with forty different spots where you can catch your wave. There are dozens of wineries in the area, as well as cheese and chocolate factories, such as the Margaret River Cheese Company, maker of boutique cheeses and yogurt. While you are at the Visitor Centre, pick up the Heritage Trails brochure. All three trails start at the Rotary Park (with relics from the lumbering days at Margaret River) and follow the river for varying distances. All the walks take you through local flora, such as the Karri-tree forest. Drive 139 km south and east (just under two hours) via the Bussel and Vasse Highways to Pemberton, a lovely town surrounded by forests of Karri, Jarrah and Marri trees. A lumber mill built in 1913 to supply wood for railway sleeping cars is still operating and can be toured. The famous Gloucester tree is one of the many tall trees in which fire-lookout cabins were built. Pemberton is almost surrounded by national parks, and you can book river cruises or guided canoe and hiking trips through them at the Tourist Centre. 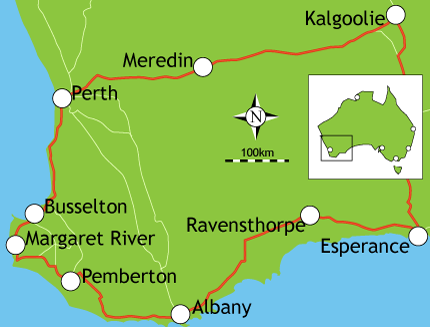 Beedelup National Park is 19 km west of Pemberton on the Vasse Highway. Covering 1,500 hectares, the park has both Karri and Marri forests. The Beedelup Falls can be viewed from suspension bridges or viewing decks. Be sure to stand inside the 'Walk Through' tree, where you will have 150 tons of living Karri overhead. This next leg takes you 239 km east (about three hours) via the Vasse, South Western, South Coast, and Albany Highways to Albany. Beautiful Albany with its snug harbor became wealthy during the gold rush days of the 1890's. Many of its elegant buildings date from that time. Five different Heritage Walks lead you through various aspects of this historic town. Torndirrip National Park is on a peninsula just south of Albany on the Frenchman Bay Road. The sea has sculpted some fantastic natural wonders here. Stay on the marked paths and behind the guide rails, as people have been swept away by freak waves. Follow The Gap Road to viewing platforms where you can see the Gap and the Natural Bridge. A Park map will help you explore other roads and hiking trails. Middleton Beach is one of many lovely beaches in or near Albany. Its five km of white sand beach is great for all water sports. The picnic area is delightful and the views are amazing. Take the Boardwalk from the Beachside Cafe for an hour and a half stroll or cycle. You will have great views of King George Sound and the islands as well as of the harbor. Drive 293 km east (about 3 1/2 hours) via the Albany and South Coast Highways to Ravensthorpe. A historic gold mining town known for its spectacular wildflowers and proximity to the Fitzgerald River National Park, Ravensthorpe is a good base for exploration of the Park and the nearby coastal town of Hopetoun. Portions of the fence made famous in the film, Rabbit Proof Fence can be seen in the area. Stay at one of the campsites in the Park, or at one of the nearby caravan parks in Ravensthorpe and Hopetoun. Though the wildflowers boom year round, the best time to visit the Ravensthorpe region from August through November, when the flowers are at their peak. The wildflowers cover the entire region, and include seventy-five species that cannot be found anywhere else in the world. If you visit the area in September, make time for the Annual Wildflower Show at the Senior Citizens Center, where you will see between 650 and 800 displays of wildflowers. The area of Ravensthorpe and Hopetoun is perfect for spotting Southern Right Whales, who make an appearance in the winter and the Spring to have their calves. Consult with the locals for the best viewing points, some of which are within the Fitzgerald River National Park. From Albany, travel 188 km east (just over two hours) via the South Coast Highway to Esperance. Take time to enjoy its white sand beaches and turquoise ocean; Twilight Beach is one of the most popular beaches in Australia. Four national parks are nearby. Visit the town's pet sea lion, Sammy, at the tanker pier, and stroll among the inviting shops and galleries. Stop by the Mermaid Marine Leather shop for interesting items made from fish skins! Only a ten-minute walk from the center of town, this Big4 park features a modern amenities block, TV room, children's playground, laundry facilities, BBQ areas, LPG refills, laundry facilities, tour bookings and a postal box. Accommodations include self-contained unites, concrete or grass powered sites, and camping areas. Cape Le Grand National Park, with its sand plains and granite outcrops, is one of Australia's most spectacular. Visit Lucky Bay and you may see sunbathing kangaroos along its 5km beach. Especially from September to November, you can see spectacular wildflowers. The Great Ocean Drive is a long loop, partly paralleled by a bikeway. Read the signposts as you go, and visit Twilight Cove and other beaches for fishing and swimming (and scenic viewing), the wind farm and the Pink Lake. This archipelago is scattered across the bay. You can take a tour or charter a boat to enjoy the clear water, perhaps see porpoises and whales, dive or snorkel. Some of the larger islands have camping facilities, but you can enjoy a beach picnic on most of the islets. Tour this working farm with its acres of protea plants. You will see buffalo, deer, elk, alpacas, ostriches, kangaroos, emus, camels, cattle and sheep. Located 20 km from Esperance, the farm is closed Tuesdays and Wednesdays, except during school holidays. The longest driving day of the trip, today you will travel 391 km northwest (about 4 1/2 hours) via the Coolgardie Esperence and Goldfields Highway to Kalgoorlie. Kalgoorlie's Golden Mile had the richest concentration of gold anywhere. Now that Mile is a huge open pit. Located on the Nullarbor Plain, Kalgoorlie is filled with historic buildings from the era of the independent prospector, so do take some time just to mosey about. Located off of the Great Eastern Highway and 3km from the center of Kalgoorlie, this pet-friendly park offers a camp kitchen, children's playground, swimming pool, BBQ areas, and a TV and Internet room. Choose from ensuite cabins, standard cabins, ensuite rooms, and powered and unpowered sites for campers and caravans. You can fossick on vacant crown land or with permission of the leaseholder or owner. Do be sure to ask permission; many people will not permit you to fossick on their land. Visit the International Lapidary for local advice and for metal detectors. The Kalgoorlie-Boulder Super Pit has yielded over 1000 tons of gold over the last 100 years. You will get the best photos during the middle of the day, so parts of the huge pit are not in shadow. You can get blast times at the Kalgoorlie Visitor Centre. Drive 334 km west (about four hours) to the heart of the Wheatbelt. Merredin, with its sweeping vistas, is an artistic center with a significant military history. Hike the Merredin Peak Heritage Trail, take one of the Rock Hop routes to see local wildflowers and birds, and stop by the Old Railway Station where the clay bricks are rumored to have gold in them. Located in Southern Cross just off the Great Eastern Highway between Merredin and Perth, this park features a swimming pool and BBQ areas. Choose from ensuite cabins, self-contained cabins, and camping sites. You can easily see the 50-foot tall water tower from the Great Eastern Highway. Built in 1893, it provided water for steam locomotives until the 1960's. The Merredin Military Museum is next to the water tower. Also in the park is the Merredin Museum with displays on steam trains, the Army hospital and pioneer women. Local artists display their work at the Country Nostalgia Gallery. You will find pottery, glassware, wood and ironwork, stained glass and bush furniture. Do find the community-built mosaic at the roundabout on the Kalgoorlie end of Barrack Street and the mosaic at the Council Offices on the corner of Barrack and King Streets, which was designed by local artist Ann Sutherland. The Zig Zag Wildflower Garden showcases local and rare plant species, including the endangered Sandpaper Wattle. The herbarium of local plant species will also help you identify the wild flowers you are seeing. The garden is always open; check with the Merredin Visitor Centre to tour the herbarium. Drive 262 km west (about 3 hours) back to your starting point. Perth, on the Swan River between the Indian Ocean and the Darling Range, is the capital of Western Australia. Perth is famous for its cultural scene, with His Majesties Theatre, the Western Australian Art Gallery and the Perth Concert Hall. Beaches and sports, especially cricket, and the Mediterranean climate bring residents and visitors outside.